is the day of parting with the world. But it is actually the day of gathering with the angels. But it is actually the beginning of another life. but a wayfarer on the road of life. 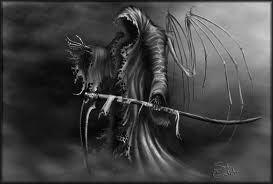 he shakes your hand and introduces himself as ‘Death’. is the most tragic experience of life. what is dying inside us while we remain living. A lot to ponder.Happy New Year. that’s Bang on Jessica,,one of the best quotes out there!!!! Just returned for a second read. This one is a keeper. death is just as much a part of life as birth. it is sacred, too. like you say here, the true tragedy is when that which should be flourishing is dying – the Light of Love, a term you’ve introduced me to. Yeah Meggie, you’re right, death really is a part of life. I still think its a sad part though:( Oh well, it is the memories that count and the feeling when we have when we think about the people we loved and lost. What a heavy, but beautifully written piece, Subhan. Thank you so much for writing and posting! I somehow missed reading this one before so am indebted to the many who delve back into archives and bring things to my attention. The last sentence is a powerful finish to your poem. deep understanding about the Death. .while leaving the world, say Remember. You beautifully narrated the lines of Death. Another deep poem, full of eternal sense! Yes yes, I sure will! 🙂 There is a lot of interesting beautiful stuff on your blog i’m up to checking out soon! Another profound truth. 🙂 Love the imagery here. Again I have to say that your writing is very deep and meaningful! Whenever I read something written by you, I learn and experience something new, or some unexpressed words inside me taking form. Oh my god. This was absolutely beautiful. And it was encouraging as well. This is my first visit to your site and I have enjoyed much of your work. This piece is especially meaningful and true. I have met the messenger personally several times and each time he only greeted me and passed by. You write very well. I love this and share your sentiment about life and death. Continue to use your gifts to be a blessing my friend. A wise voice speaks again and it is true that how we live our life while we are here is that which can be either tragic or wonderful. Thank You! Beautifully written thoughts, as always. I love this and believe it is true! Wonderful prose Subhan. Thanks so much Subhan! I am smiling! A great read – as always. I have always tried to get ready for death … meaning living this life to the fullest. Life for us must go on….with memories remains..
Subhan the ultimate truth of life is our last day on this planet and not “what is dying inside us while we remain living”. Sorry I meant the other way around 🙂 The ultimate truth is NOT our last day but “what is dying inside us while we remain living”. Subhan, This is one of the best I have read from you. I shared it on my FB page at Inspiration Import. Beautiful and timely with the Grim Reaper shot! You are simply brilliant my friend. How touching this is … and how true! Beautiful words, a change of consciousness and energy is death, not an ending. Love to you, such a spiritually aware and lovely heart you have. Yes, death is only the next step , the transition to another form of existence, In a world of a loving creator, why would death not be profoundly beautiful.?.. Oh is it so! shall have to check..might be landed in spam! Great message and thiughts dear Shubhan! Peace and blessings! Subhan, this blog is the ultimate you have written so far. Absolutely earthshattering. Your last three lines are very insightful … A wonderful reminder, Subhan, to enjoy life to the fullest every second. An amazing poem my brother! My mother passed away last month. I was her home hospice care nurse for last 6 weeks of her sudden, unexpected and rapid explosion of cancer. I was astonished at despite the haze or morphine and having one foot in death she remained as long as she could and communication her love as best she could. Half an hour after she died a tear formed and fell from her left eye. I am convinced there is a link to the other side after this personal experience. Subhan, please can I have your email address?Thank you. Wow. THis is great Subhan. Wonderful writing (again). The last 3 lines really ring true. You have summed up so much in those lines. Thank you. I love this blog. I enjoy your writing tremendously.